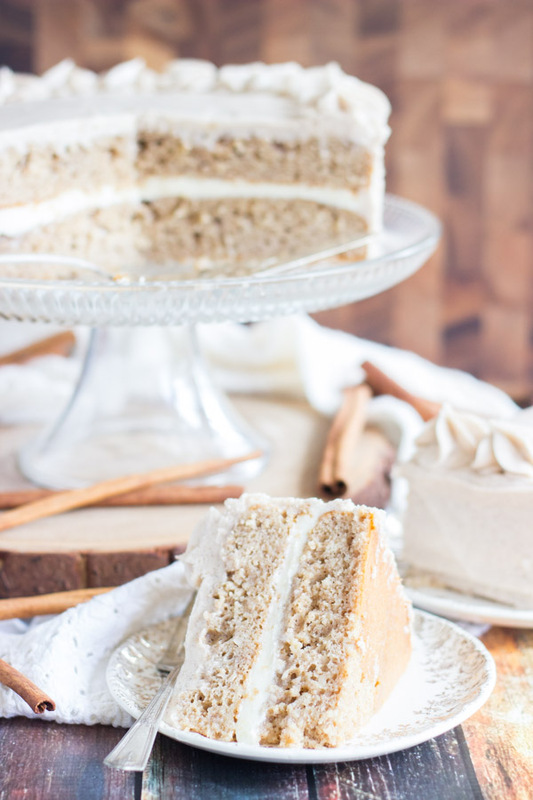 This Snickerdoodle Poke Cake features two dreamy layers of snickerdoodle cake, doused in a cinnamon and brown sugar syrup, and slathered in snickerdoodle buttercream! 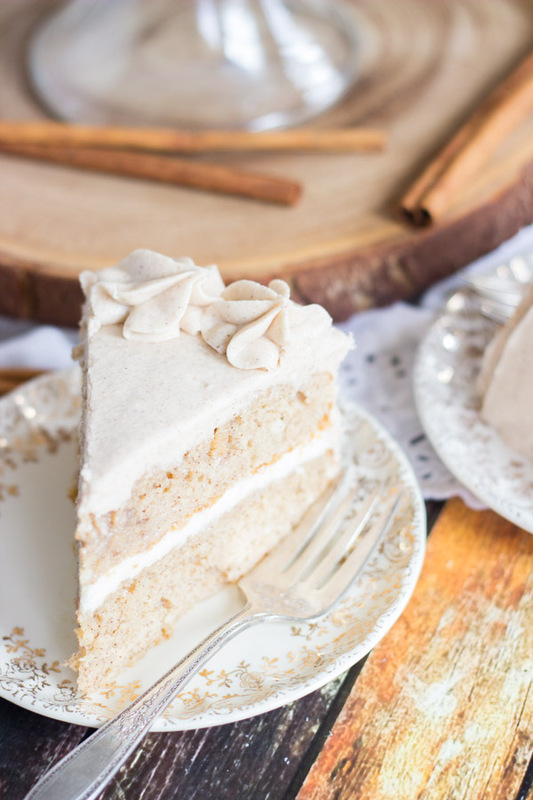 This Snickerdoodle Poke Cake is truly out-of-this-world! Follow along on Pinterest to easily view all the blog recipes! I NEVER make layer cakes because I stress about decorating them. I haven’t done any cake decorating in years, and when I look around at other blogs, I nearly fall over by how beautiful they decorate their cakes. I can’t handle the pressure of living up to other blogs’ layer cakes! So I didn’t even try, until this Snickerdoodle Poke Cake Layer Cake. I have done some cake decorating in my day, but it’s been YEARS. I lived in San Francisco for two years, and I hardly knew anyone there. Berkeley wasn’t far from me, and it was a very artsy area. To meet people and to occupy myself, I signed up for a bunch of classes at a local adult school. I took pottery, stained glass, mosaics, and cake decorating. I also took golf lessons, but my swing has never been the same, fyi. The cake decorating was a favorite. I’ve loved to bake for as long as I can remember, but I never concerned myself too much with how to make baked goods look beautiful and ornate. It was so fun to learn decorating techniques. Basket-weaving, fondant, different kinds of flowers, all that stuff. When I moved to Tampa, I tried to find a similar class with no such luck. It’s been almost 10 years since I’ve attempted to frost a layer cake with the goal toward having it look pretty and presentable, let alone try to pipe a flower. I was just impressed that the frosting on this Snickerdoodle Poke Cake is as even and smooth as it is. I’m easing back in. Flowers can come later. I’ll just stick with simple stars on the edges for now. Actually, scratch all that. Are YOU going to pipe flowers onto cakes? 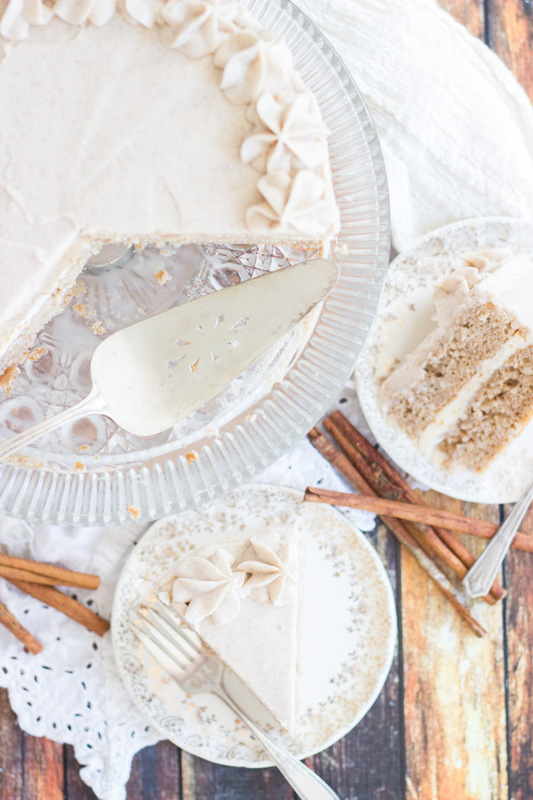 Let’s keep things simple… that’s what I did with this Snickerdoodle Poke Cake, and it was very achievable! 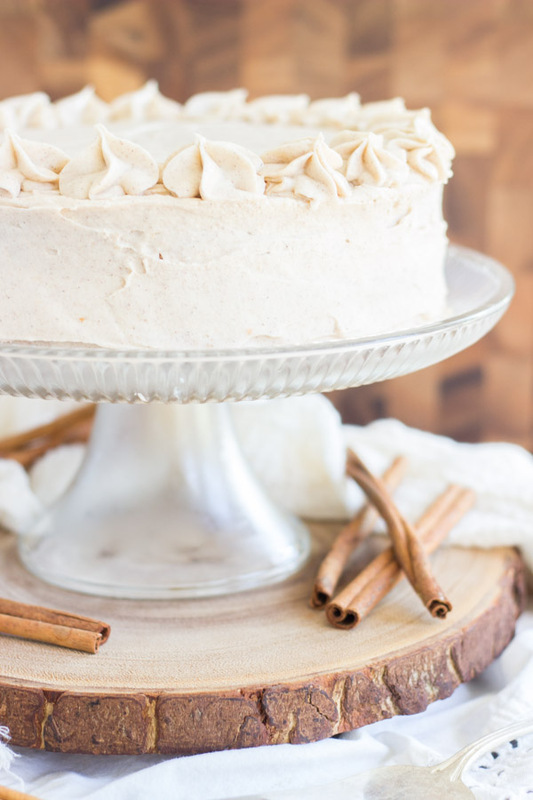 Speaking of keeping things simple, this Snickerdoodle Poke Cake Layer Cake starts with a cake mix. Yes, it’s a doctored-up cake mix. I love cake mix recipes. I’m no snob about it. With melted butter, sour cream, and a few other additions though, the white cake mix is transformed into a much richer cake, and it’s loaded up with a ton of cinnamon for warm spice. 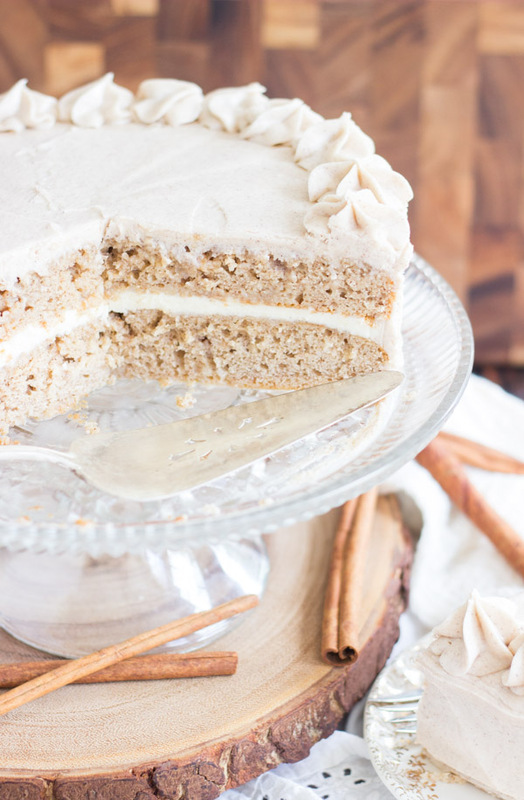 As the Snickerdoodle Poke Cake name would suggest, you’ll poke holes in it. You’ll drizzle each layer of cake with a mixture of sweetened condensed milk, butter, brown sugar, and cinnamon. The syrup is absurdly good. Drenching the cake layers with that crazy, wonderful syrup turns them into something extraordinarily delicious and gooey and sticky. Stack the cakes with snickerdoodle buttercream in between each layer, and slathered all around it. 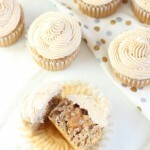 Fluffy vanilla buttercream packed with cinnamon! 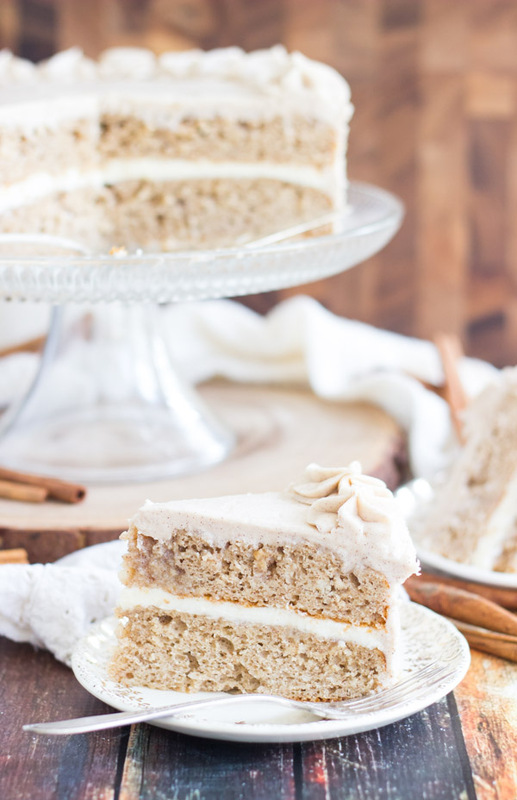 This Snickerdoodle Poke Cake Layer Cake is sweet, it’s spicy, and it’s gooey. It’s the perfect cake, if you look past the decorating. 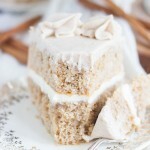 If you love cinnamon and snickerdoodle stuff, then this Snickerdoodle Poke Cake is a must-make. 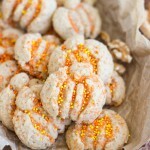 If you like snickerdoodle desserts, I’ve also shared these Snickerdoodle Thumbprints with Cookie Butter Buttercream. They are AMAZING. 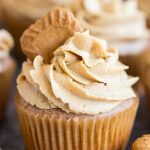 The cookie butter buttercream is absolutely outrageous! 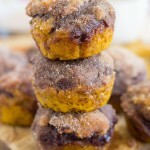 And I also have these awesome Snickerdoodle Pumpkin Nutella Muffins. Omg, are they good, and they are ready in about 30 minutes, start-to-finish! Also, this Pumpkin Snickerdoodle Cobbler is easy as can be, and it’s a total fall favorite! Two dreamy layers of snickerdoodle cake, doused in a cinnamon and brown sugar syrup, and slathered in snickerdoodle buttercream! In a large bowl, whisk together cake mix, whole milk, sour cream, butter, eggs, cinnamon, and vanilla. Divide batter evenly into two greased or parchment paper-lined 9-inch round cake pans. Bake at 350 degrees for 20-25 minutes, or until a toothpick inserted near the center comes out clean. Cool for 15 minutes before removing cakes from pans to wire racks. While cakes are still warm, gently poke holes with a fork, toothpick, or similar utensil, but not poking through the bottom of the cake. In a small bowl, whisk together sweetened condensed milk, butter, brown sugar, and cinnamon. Divide the sweetened condensed milk mixture between the two layers, drizzling it evenly over the top, keeping it away from the edges by about 1/2-inch. Use a knife or spoon to keep the mixture on the top of the cakes, and not down the sides. Allow the cakes to sit and absorb the mixture for about 5-10 minutes. Refrigerate cakes til firm, about 1 hour. This will make transferring them to a serving platter much easier. They become slightly fragile with all the holes. In a large mixing bowl, combine butter, 4 c. powdered sugar, cinnamon, vanilla, and cream. Add more powdered sugar or cream as needed to achieve desired consistency. It should be thick and fluffy, but able to be piped. Beat an additional 3-5 minutes for fluffiness. Carefully transfer one cake to a serving platter. Spread it with a 1/4-inch thick layer of buttercream. Arrange the second cake layer on top. Frost cake. Cut and serve. Poke cakes are one of my all-time favorite desserts, and this layered version sounds incredible. I think it’s beautiful, too! This is absolutely brilliant!! What a clever poke cake idea. A poke LAYER cake?! You are pretty much my favorite person right now. LOVE this idea! This is easily the prettiest darn poke cake I’ve ever seen! 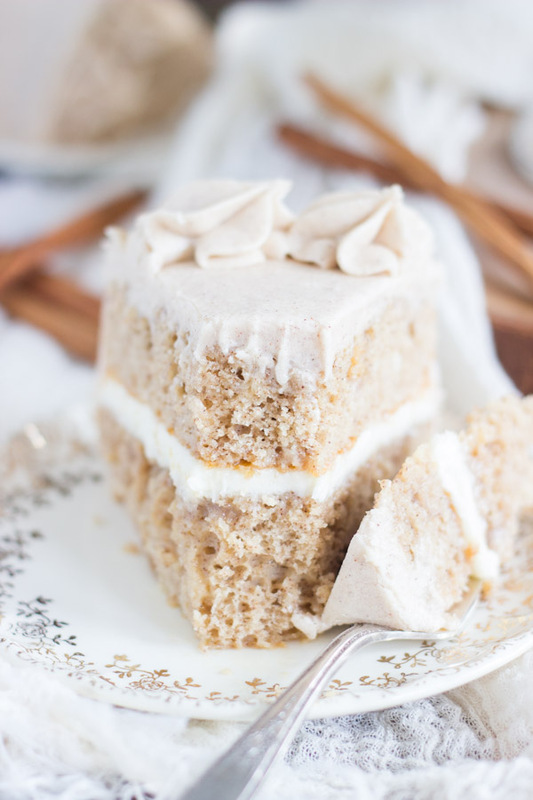 So elegant and still so moist and delicious… I’ve gotta try this ASAP! Thank you so much, Karly!! I think you should definitely share more layered cakes, this one is just gorgeous, Sarah! Snickerdoodle anything is a favorite and it would be devoured in no time at our house! Thank you, Kelly!! I’m trying to step up my layer cake game! Lol! I’m curious do you leave in pan to pour stuff over like a normal poke cake? You take it out from what I can tell, but how in the world do you keep from running down the side if you take out. I’ve never had poke stuff that isn’t runny and that will be one big mess. Won’t it run down the edges no matter what. COULD YOU PUT ON PARTCHIMENT PAPER TO HELP MOVE IT? Just wondering for sure. Hi Wanda: Did you read through the recipe instructions? It’s all in there. I took the cakes out of the pan and placed them on wire racks. Because of the holes, they become more fragile to move from the pans, so I removed the cakes from the pans to wire racks BEFORE poking. I poked holes in them carefully (not going all the way through to the bottom of the cake), then when I poured the syrup over, I used a spoon to keep it on top of the cake, and didn’t let it drip down the edges. You can certainly let it drip down, it’s not a big deal if it goes down the edges, but I just used a spoon to keep it on top of the cakes. Let them set for a few minutes for the syrup to soak in. It doesn’t soak quickly. You could probably use parchment paper as an alternative, and you could put parchment paper under the wire racks if you are worried about dripping. I then refrigerated the layers for a bit to get them firm so they’d be easier to transfer and stack. Once the layers were chilled, they were easy to move from the wire racks to the serving plate. Please let me know if you have any other questions! Happy to help! Thanks. Right??? I’m trying to up my game though! So glad you like this one. Thank you! Your photos are beautiful. Well done! This recipe looks delish. You can never go wrong with cinnamon. Love it. I love anything snickerdoodle! Thanks for sharing on the What’s for Dinner link up! This is so pretty and delicious! That buttercream, though… Thanks for sharing at the Share the Wealth Sunday blog hop! Wow, this sounds so good! Snickerdoodle cookies are so yummy I can only imagine how good that cake is. Thanks for joining the Family Joy Link Party! Perfect fall dessert. And your cake decorating is elegant! I like it. Oh, thank you!! The cake decorating needs some work, but I’m practicing! Delicious! 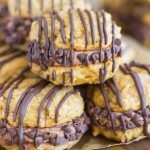 Thanks for linking up to the Creative K Kids’ Tasty Tuesday! 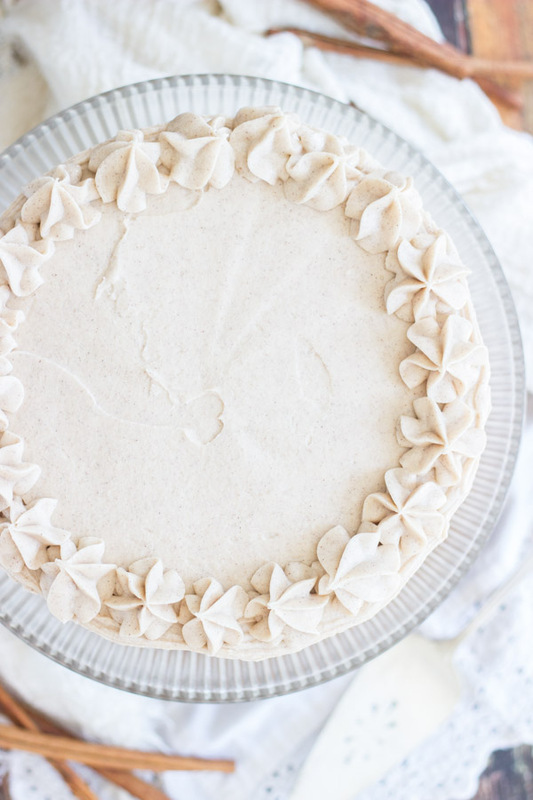 Do you think refrigerating overnight before frosting is okay? Trying this for Thanksgiving dessert! Absolutely! That should be totally fine! I refrigerated the layers to firm them up before assembling it so that it didn’t crumble apart. The holes make the layers a bit more fragile. Refrigeration will be fine! I hope you like it – please let me know! Happy Thanksgiving! What changes would I need to make to do this in a 9×13 like a regular poke cake? Like, would the cooking time change, etc? I think other than cooking time, you probably don’t need to make any other adjustments. You may have a bit of extra frosting, but that’s not such a bad thing. I would just follow the baking time on the cake mix box for a 9×13! Depending on the brand of cake mix you buy, it will be a bit different, but the cake should just bake according to the package instructions for a 9×13! Good luck! This cake looks amazing!! I was wondering if you know if I could possibly make it in advance and freeze the layers without it affecting the taste/texture? Then of course thaw the layers before assembling, I’ve done this with normal cakes with no problem, but I haven’t tried it with a poke cake. You know… I’m honestly not sure. We often freeze half of our desserts since it’s just the two of us, and I know I’ve frozen poke cakes – I don’t recall them having an issue thawing back out, but I definitely agree that it *could* affect taste/texture. I don’t remember it standing out as a problem, but it definitely could. To be on the safe side, I would probably avoid it if you can, unfortunately! I know that doesn’t make it very easy to prep-ahead!